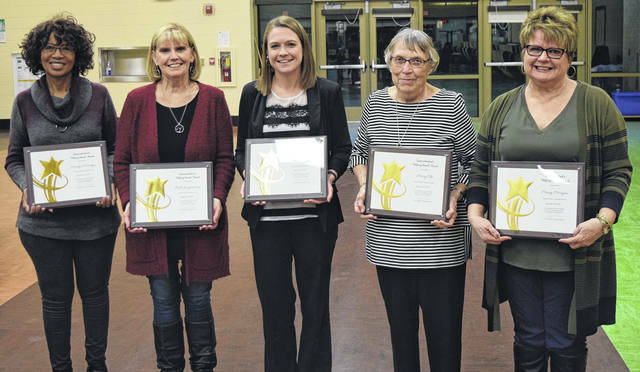 Pictured left to right are the Superintendent’s Helping Hands award winners Marilyn McFadgen, Beth Langenkamp, Corrie Lievsay, Mary Olt, and Mary Morgan. ENGLEWOOD — At Monday’s Northmont Board of Education meeting, five women received the Superintendent’s Helping Hands award, Marilyn McFadgen, Beth Langenkamp, Corrie Lievsay, Mary Olt, and Mary Morgan. These ladies all go above and beyond to help out in the classrooms at the Kleptz Early Learning Center and are champions of education. The Kleptz Early Learning Center is one of Northmont’s newest school buildings, which opened at the beginning of the 2014-15 school year. The 103,000 square foot building houses all of the Northmont district’s kindergarten and first grade students, as well as the special education preschool. In 2014, kindergarten transformed to an all-day program at the Kleptz Early Learning Center. The building was designed and constructed to be a Leadership in Energy & Environmental Design building (LEED) and received the silver designation in 2015.